Magic xpi Integration Platform SugarCRM, Inc.
Magic xpi's code-free, drag and drop, metadata-based approach lets IT and business users concentrate on orchestrating the best business processes rather than on complex programming and technical transformations. Our off-the-shelf Sugar adapter supports all SugarCRM commercial and community versions whether on-premise or cloud based and is optimized for fast and accurate connectivity with your other business systems, regardless of where they reside (on premise or cloud). 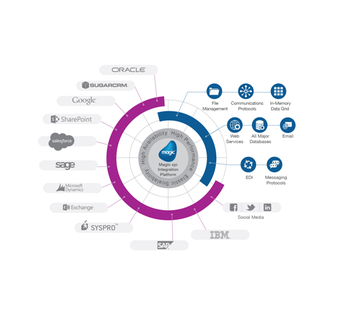 Magic’s wide variety of certified adapters for the most popular IT systems makes it easy to integrate Sugar with any ERP (e.g. SAP, Oracle JD Edwards, SYSPRO…), email and social media (Outlook, Facebook…), and other business apps including Oracle Agile PLM, PeopleSoft, Primavera, supply chain management, logistics and more. Together with our rich variety of capabilities and technology connectors, Magic enables you to complete your integration projects quickly and successfully, providing an immediate return on investment. With state-of-the-art In-Memory Data Grid (IMDG) architecture, Magic xpi provides elastic scalability and 24/7 data availability with automated data recovery, so you can be assured of accurate and real-time view of your corporate information at all times. 5 to 10 times faster than other solutions. Our highly productive, code-free, metadata-based drag and drop paradigm lets IT and business users focus on integrating business processes, not the underlying technologies. Connects any combination of on-premise and cloud systems. Magic xpi can be deployed in the cloud as well. Large set of certified and native adapters for optimized integration with leading IT systems including SAP, Oracle JD Edwards, Microsoft Dynamics, SharePoint, SYSPRO, Sage, Salesforce, IBM and more. Over 50 technology adapters for integrating a wide variety of operating systems, databases, and standards including Web services, messaging, FTP and directories, .NET, Java, RPG, HTTP, and more. Supports Windows, Linux, AIX, IBM i Series and Solaris. Easy to implement, run and maintain. No need for deep programming knowledge. One skill set for multiple integration needs. Versatile solution with highly scalable In-Memory Data Grid architecture to support current and future cloud, mobile and big data integration scenarios. Continuous enhancements and application adapters. Built-in robustness, high availability elastic scalability and extended management capabilities – eliminates need for extra IT resources. Useful for multiple integration scenarios. Secure connectivity using native and standard protocols. In-Memory Data Grid Architecture with built-in clustering, failover and automatic recovery capabilities assures business continuity; SOA-compliant; Comprehensive management and monitoring capabilities.